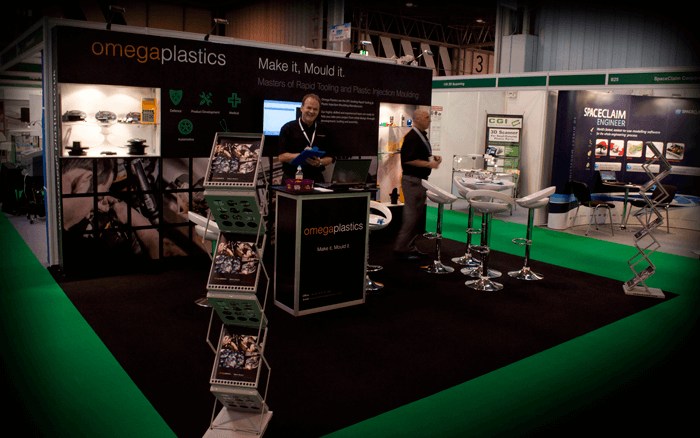 Omega Plastics attended the UK’s leading 3D printing, additive manufacturing and product development show a little over two weeks ago. We’d like to report, how it helped us as a company and the events behind it. The TCT Show + Personalize took place on the 25th & 26th of September at the UK’s largest events venue: the NEC in Birmingham. As demonstrated by so many of companies at the show, it ‘inspires creativity, encourages learning and helps develop business‘ – in our eyes the statement couldn’t be more accepted by everyone visiting the show. Stats from the previous TCT event shows an increase from almost 5000 to 6000 attendee’s from 48 different countries over the two day event. We went to the show to carry out one key aim: ‘to develop new and existing relationships with people in the product development sector’. Our representative were Dave Crone (Group Managing Director), Jonathan Galloway (Marketing Officer) along with Chris Sipos & Michael Winship – our Business Development Managers. Across the two days we managed to generate an additional 60+ contacts and/or enquiries as well as engage with some of our existing customers. “Within the first two weeks we’re seeing visible results and a potentially large ROI in the exhibition” – expressed Jonathan. 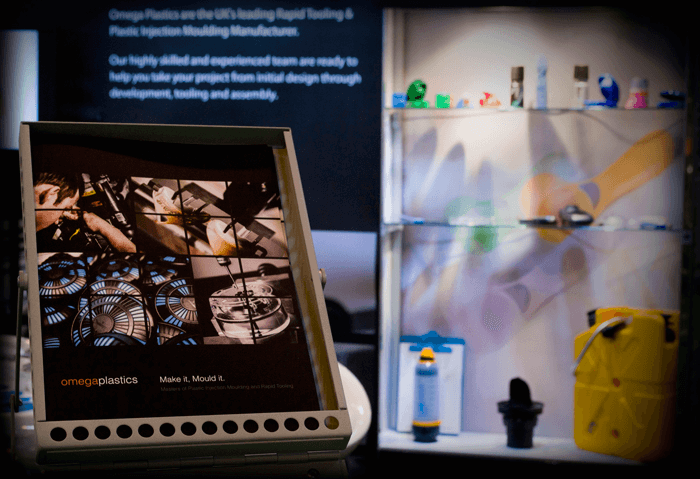 After spending the Tuesday prior to the show setting up, cleaning the stand down and organising the product samples ready for visitor use the following two days – our stand decided to convert into a ‘collapsing unit’ during an electrical check minutes before we were due to leave the NEC. After our new ‘collapsing stand’ is returned to it’s almost original structure, as Jonathan & Michael attempt to retain it’s original detailing. Believe it or not: the finishing touches to restoring the eye-catching artwork which was damaged after only a few hours of being up. After a completed stand is restored [and secured], we had ourselves a glance at the finished product. All it needed was visitors – and my did they arrive in numbers! We’re glad Michael seen the funny side of the events, and performed exceptionally well at the show along with Chris to the right. Only five hours into the event we’re running out of these…and very fast! Finally we reach a conclusion with a very tired Omega team and only a handful of brochure’s left! Perhaps next time we’ll consider the pros and cons of locating so close to a seminar zone which housed 2000 people and 20 world class speakers! To conclude; we thoroughly enjoyed the two days at the TCT Show – speaking to industry leaders and new product development companies from around the world. “We met existing customers, were introduced to new prospects and arranged meetings for the following weeks. 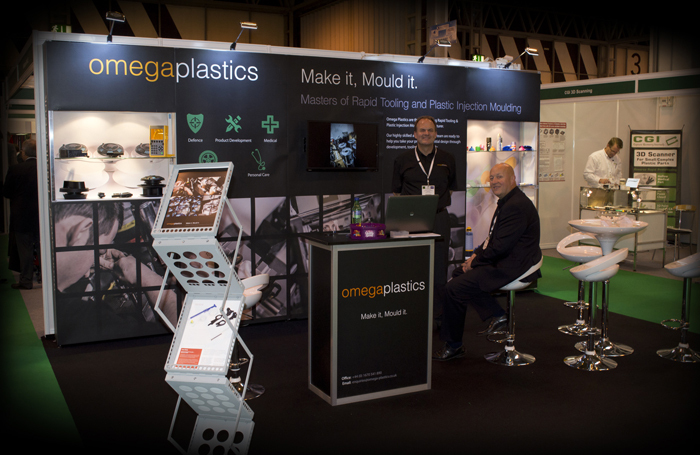 As a team we generated between 15-20 solid enquiries each day which will hopefully develop into new business opportunities and partnerships for Omega” added Group MD Dave Crone.